Whether you've decided to rent yourself out as Santa Claus, or family, friends or an organization drafted you to play him at the next Christmas party, be aware that the role of Santa should follow certain customs and norms. Santa has a code of conduct and standard uniform -- and you should too when portraying the jolly old guy. Gather the red suit, black belt, fake facial and head hair -- if needed -- and black, shiny boots ahead of time. Don't forget the padding; a large, round pillow works well. If the suit is double layered, sew the pillow to the inside layer; otherwise, use duct tape to hold it in place. Everything should fit according to legend. Yes, there are thin Santas dressed in robes around the world, but in the United States, Santa is a jolly old guy with a bit of a belly dressed in a red suit trimmed in white and wearing a red hat. The suit should fit well and not be saggy or overly snug. Wire-rimmed glasses and white gloves are optional. If you can rent a sleigh with reindeer, that's fantastic. But since reindeer rentals usually are in short supply, you should probably arrive in a car. If you get to play Santa at an adults-only party, this is fine. But for kids' celebrations, park the car where the children won't see it, then walk to the house. If ice and snow prevent you from making the half-block trek, use the excuse that some of your reindeer have colds so you had to drive. Or get to the party before the guests arrive. 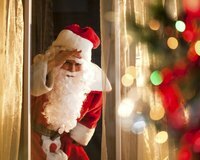 If you have to leave before all of the guests depart, leave the Santa suit on until you are out of sight. Pitch your voice as low as it can go, and don't forget to say "ho, ho, ho!" If you really want to get in on the laughter, slightly bend back and place both hands on your stomach as if to hold in the glee. Keep a smile on your face. When a child tugs at your jacket even if you're trying to eat a cookie, put down the treat and turn to the child. If the child is very young, crouch to her level. Make eye contact so that the child knows that Santa cares. If you know the names of the kids who will be present at the celebration, write them down on a piece of paper under the header "Nice." When you ask the child's name, you can examine the list and find him under the "nice" column. If you have fake hair or facial hair, keep it securely in place so as not to reveal your natural hair color. A loose mustache-and-beard combo may cause confusion among young kids; also, hide the straps to these as much as possible. Do not talk about adult topics if you are around children. If you need to change or adjust something, do it in a locked bathroom or locked bedroom.